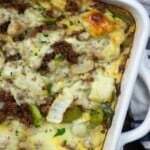 This Philly Cheese Steak Casserole has all of my favorite flavors from a traditional cheese steak, but it's budget-friendly and perfect for those on a keto diet! Dice the peppers and onions into bite-sized pieces. Mince the garlic. Add the ground beef to a skillet and cook over medium heat, crumbling as it cooks. When beef is broken apart, but still pink, add the peppers, onion, garlic, and seasoned salt. Continue cooking, stirring often, until beef is cooked through and vegetables have softened a bit. Drain grease from the skillet and pour mixture into the prepared baking dish. Tear the cheese into small pieces and place over the beef mixture. Add the eggs, cream, hot sauce, and Worcestershire sauce to a mixing bowl and whisk well to combine. Pour the egg mixture over the beef and place the dish in the oven. Bake for 35 minutes or until the eggs are set. Let sit 5 minutes before slicing and serving.